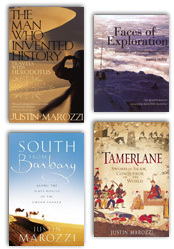 The desire to explore the unknown has been a driving force for mankind since the dawn of time. Early humans searched for the means to survive. Later, modern man searched for information about his environment and in the process mapped the world. Men and women climbed the highest mountains, traversed the most treacherous deserts, crossed the high seas, and scoured the depths of the oceans. They took to the skies and launched themselves, finally, into space. They collected fossils and meteorite samples, discovered cures for diseases, named parts of the earth, species of animals, plants and fish. 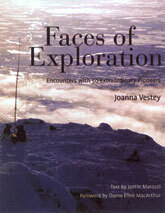 Faces of Exploration tells 50 gripping and inspirational stories, milestones of exploration and epic adventure. They include the first ascent of Mount Everest without oxygen; the solo crossing of Antarctica on skis; the fastest circumnavigation of the world by balloon; the mapping of the deep oceanic ridge of the mid-Atlantic and the first landing on the moon.